Feral and pet cats kill more than one million birds in Australia every day, new research showed Wednesday, with the staggering slaughter driving the decline of many species. The study, published in the journal Biological Conversation, estimated that wild cats wiped out 316 million every year, while pets killed 61 million annually. 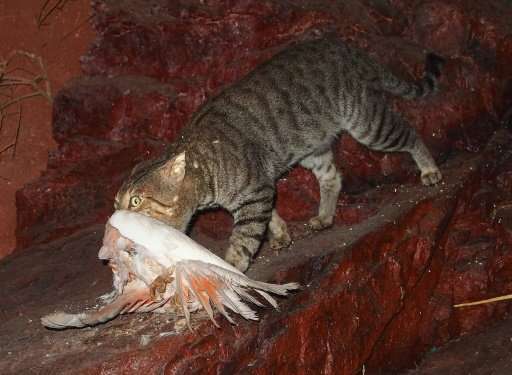 "Everyone knows that cats kill birds, but this study shows that, at a national level, the amount of predation is staggering," said lead researcher John Woinarski from Charles Darwin University. "It is likely to be driving the ongoing decline of many species." The numbers are based on results from nearly 100 studies across the country by environmental scientists, each sampling cat population density. Another set of almost 100 studies assessed feline diet. Woinarski said that while previous research had looked at the impact cats had on Australia's mammals, this was the first nationwide assessment on birds. It found the highest rates of predation were on Australia's islands and in remote arid areas, where the number of birds killed each year could reach 330 per square kilometre. Feral cats, which number in their millions across the country, are also considered the main culprit behind Australia's high rate of mammal extinction. They have wiped out entire populations since being introduced by Europeans who settled in the country two centuries ago, with efforts to cull or sterilise them so far failing to slow their march. The researchers found evidence of cats killing 338 bird types—almost half of Australia's native species, including 71 threatened species such as the spotted quail thrush, the squatter pigeon, and the night parrot. "We found that the birds most likely to be killed by cats are medium sized birds, birds that nest and feed on the ground, and birds that occur on islands or in woodlands, grasslands and shrublands," said Woinarski. Australia's Threatened Species Commissioner Sebastian Lang called the study "extremely important and of great concern". "Our knowledge of the impacts of cats on threatened mammals was a major stimulus for our first-ever national Threatened Species Strategy, which prioritised actions to control feral cats," said Lang. "This new research emphasises the need to continue working to reduce the impact of cats on our native biodiversity." Under the government's Threatened Species Strategy, more than Aus$30 million (US$23 million) has been mobilised for projects to reduce the impact of feral cats on wildlife. In June, construction began on a huge cat-free zone in the desert covering 69,000 hectares (170,500 acres) to allow native animals that have been pushed to the brink of extinction by the predator to be reintroduced. Cats are worth more than birds. There are probably 400 billion birds on Earth, they are in no danger of being wiped out. However, some types are vulnerable, ground-dwelling birds, like Killdear. The cat on the other hand....a trip to the local animal welfare shelter and a $50 donation if you can't find someone giving them away in your neighbourhood. Was there some other value you were referring to? No, exactly the opposite, did you just read what you wanted to see there? I'm asking rrander to justify why it thinks "Cats are worth more than birds." Not in Australia. A hand-reared Rose Breasted Cockatoo (Galah) is worth less than $250. The interstate roads are littered with them as they are too stupid to avoid cars. Nobody cries about that here, nor all the other marsupials, mangled on the side of the roads. Corellas are routinely shot by farmers because they eat crops. Many other native animals are poisoned around tree plantations. So there is a fair bit of hypocrisy in this debate. So theyll have to train the rabbits to kill the cats. I was out running one evening and saw a rabbit run up to a cat and stop dead right in front of him, eye to eye. The cat just sat there, its eyes half open, cool as can be. I think they were playing. I'm asking rrander to justify why it thinks "Cats are worth more than birds. Because hes an idiot. That ones easy. "This bird is no more! It has ceased to be!" Everywhere I've lived that stray cats are illegal hunted and killed off they quickly get severe rodent problems destroying their houses. Of course, it is good for the poisoners. I wonder how much pesticide control kills birds. They are now spraying pesticide over many cities in US that have west nile mosquitoes: all pets are supposed to be kept inside at nights--what about all the birds, bats, frogs, etc and homeless people and uninformed and stray pets...ohhh it is okay, just kill em all...who needs 'em.